Dec 24: Reached Koramangala around 5AM which is too early and chill. Called my friend and went to his house! Reaching home, both of us didn’t sleep and were chatting about the trip. 11.30AM: Deepak came and picked me near Koramangala Ganesha temple, 8th block in his Maruthi Ertiga which is an year old and ran around 38,000 kms. Started and headed towards Banaswadi picked up Aditya. The trip starts officially from his home. Kept lemon under the wheels, prayed and started the vehicle. Went to the Banaswadi railway station to pick Karthi who is arriving by train. Some mandatory rule is there that all the vehicles should carry a yellow sticker across the left head lam in Gujarat it seems. 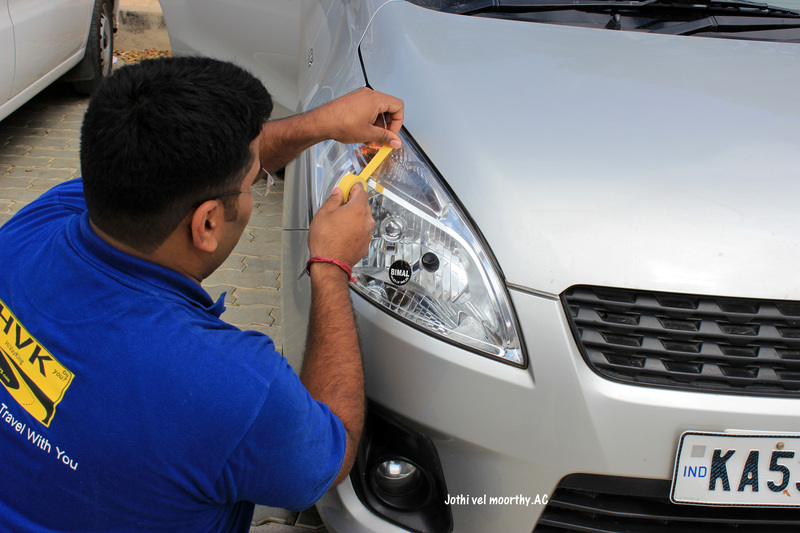 Its believed that the yellow sticker cuts the glare from the headlamps for the benefit of oncoming motorists. Much like what the half black paint on the headlamp used to do in earlier days. 1.00 PM. Train reached late by 45 minutes. Picked him and headed towards the outskirts of the city and after 40mins hit NH4 at Nelamangala. The first halt destination for this drive is Udaipur. Google map shows 1,689Kms covered in 23hours. 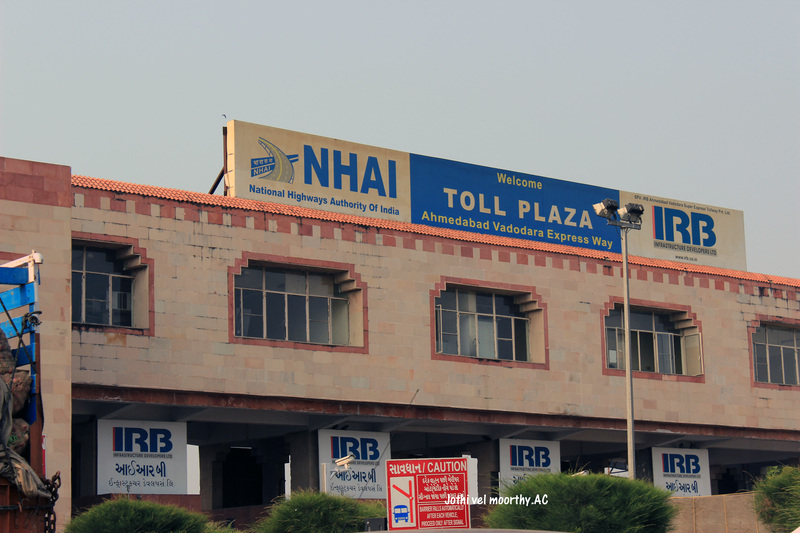 According to NHAI, India has 33Lakh kms of roads across the country which is the second largest country in the world. Its difficult for one to travel through all these in his lifetime. I wish I could do my level best in my life time.. Surprised to see that I am added on a whatsapp group called AIM 2013. HVK has created it to update the road status. People keep posting messages about the road conditions, traffic and also about their travel plans..which was very useful to connect with unknown people and also made the travel interesting! 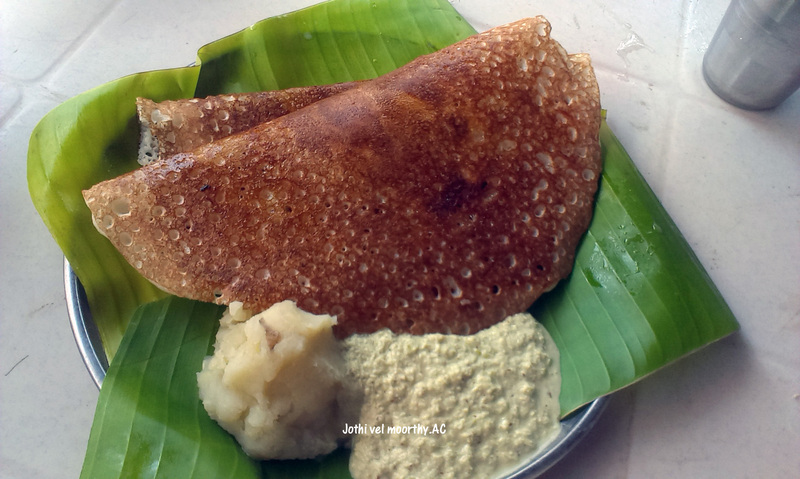 While chatting with my fellow man, I am surprised to see that they planned the trip in such a way even food locations were included.One such destination was Davangare to have butter dosa. Awesome it was. Continued the journey. Excellent connectivity by BSNL in both ways calls and data. Kept updating on my Facebook wall. 11.00 PM Crossed Karnataka and entered Maharashtra. Here I tried to update in Facebook. Unfortunate couldn’t connect. Thought poor signals and left it. Dec 25: Woke up around 6AM. Saw the car snailing in the traffic around at Ghodbander. Tried connecting with Facebook, unable to connect. Felt suspicious and checked the data settings, found my GPRS settings belong to Cellone_South and after that not able to connect. Googled from my fellowmen’s mobile for the BSNL settings and updated, restarted.. holycow… I am connected! Stopped near a Bharth COCO petrol bunk and got refreshed. Time for breakfast. Entered a roadside hotel, Since we have entered in Gujarat, asked for Guajarati breakfast. The waiter starred at us and showed the menu that contains south Indian dishes. Compromised ourselves and ordered for a plate of idly vada. 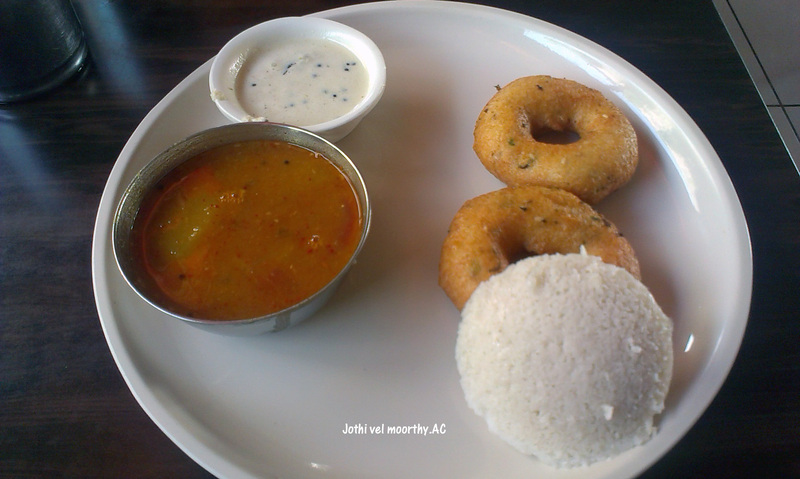 Never expected a plate of idly vada is one idly and two vadas and not two idly with one vada. 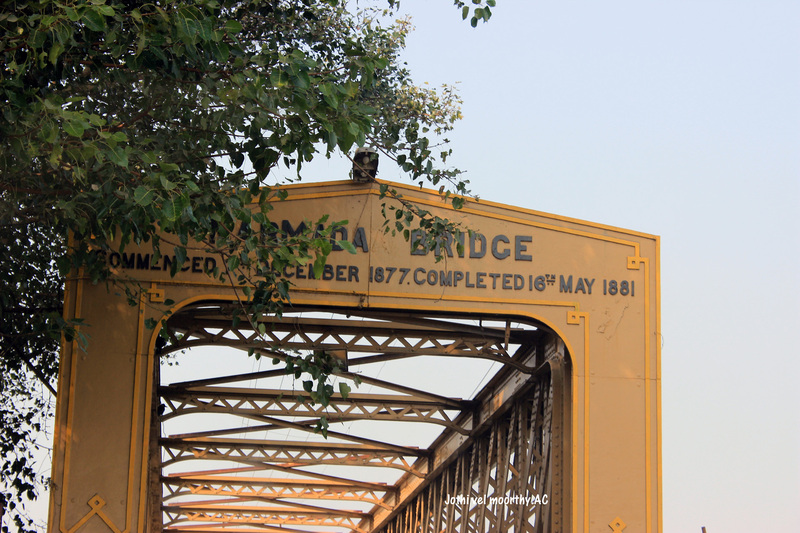 Passed via the historic Golden bridge between Ankleshwar to Bharuch. 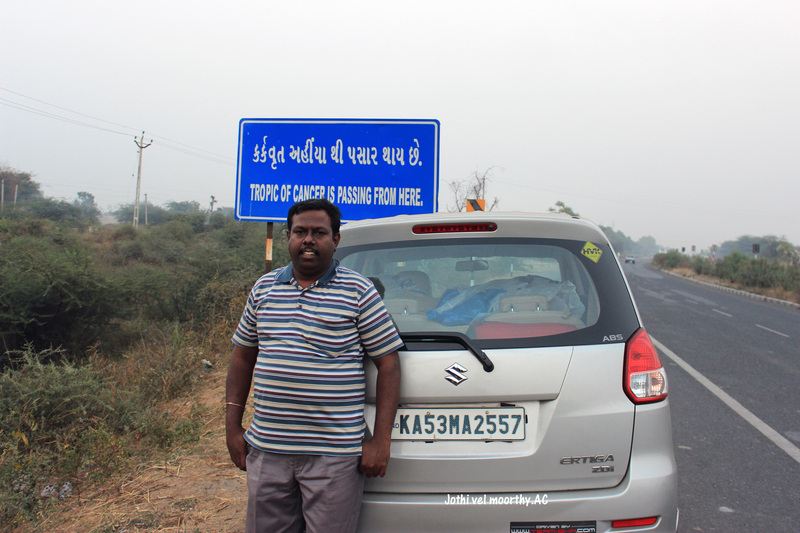 By-passed Ahmedabad via the Ahmedabad-Vadora National Express Highway [ NE-1] which was plain and fabulous. Entered the state of Rajasthan which is also known as the Land of kings and the largest state of india. Finally reached Udaipur at 9PM! Getting South Indian breakfast while you clearly expected Gujarati food. Now you should definitely Vote for India!